Step 1: Comb and dry your hair. ---Step 2: Apply heat protectant and KIPOZI Argan oil. Step 1: Comb your hair and prep hair with a thermal protectant and KIPOZI Argan oil. 1 Drawstring velvet storage bag. For intensely glossy hair with 86% more shine choose the Shine Therapy Straightener. The Advanced Ceramic coated plates are infused with natural Moroccan Argan Oil and Vitamin E that when heated evenly emit shine enhancing Micro Conditioners through the plates on to your hair. Hair Straightener. 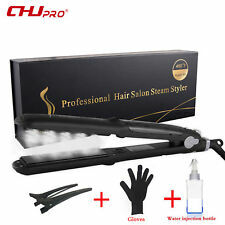 Professional Wet/Dry Steam Hair Straightener. • Product:professional ceramic hair straightener. 1X CHJ Hair Straightener. • Steam settings(30-60s to Steam Up) vapor-blast hair with unbelievable shine and smoothness. The plates help to move the iron smoothly in your hair and you don’t feel stress. 1 Drawstring velvet storage bag. Color：Matte Black. Tip 1: Dry and brush your hair. 1 Professional hair straightener. Feature： 2 in 1 hair styling tool that can straight hair, curly hair. Ceramic coated plate, protecting the hair from damaging. You can choose different styles in different occasions like dating, party, club or meeting with your friends. Now you can create a beautiful hair style in a matter of minutes! the hair should last 2-3 days (or more). Advanced PTC heater delivers consistent heat distribution with ultra fast heat-up time, just long enough 360 degree tangle free swivel, keep the cord from getting all tangled up when you are done with it. Parameter: Universal voltage: 110-240V, 50-60Hz. Power: 45-65W Plug: UK Plug Size: 27 * 3.5cm / 10.63 * 1.38in Package Content: 1 * 2-in-1 Hair Strightener / Curler 1 * User Manual Note: Straight hair, curls, hair extensions shou. (Why Choose Himaly Cordless Hair Straighteners？. Ceramic coating hair straighteners which can heats up quickly. 【Heats Up Quickly & Adjustable Temperature】 Only 40s instant heat up, with adjustable temp range from 165°C - 205°C（320°F-401°F) which can suit for all hair types, like thick ,frizz and curly hair. 2 in1 Hair Curler/Straightener Curling Straightening Hair, Now you can create a beautiful hair style in a matter of minutes! Depending on the style you're going for, we're talking 10 minutes or less.seriously! Professionally refurbished ghd 5.0 gold hair straighteners, good cosmetic condition, may have odd mark to arms or plates from previous use, but nothing major and in great working condition, 90 day warranty and 30 day money back guarantee. 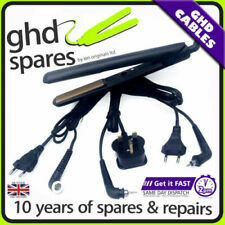 All our refurbished ghd's are pat tested and fitted with brand new UK mains cables. No original box but comes in new postage box. It contains 4 interchangeable plates, which are flat plate for straightening hair, three different size of wave plates for curling hair. The change of different plates is very easy and quick. 4 in 1 interchangeable plates hair straightener, flat plate, Large, Middle, Small wave plate. Professional 230 Degree Ceramic Tourmaline Straighteners Salon Stylle Styler Pro Features Description: - Ceramic Tourmaline Coated Plates For Added Protection When Styling - Tourmaline Technology - Instantly starts heating - Longer Length Plates For Faster Styling - Heats to 180 Degrees in 90 Seconds (Max Temp: 230 Degrees) - 360 Degree Swivel Cord - Suitable for All Hair Types Whats included - Hair straightners - Instruction leaflet with how to style steps. Be hairstyle ready for whatever life sends your way, with longer-lasting styles from the professional grade PROluxe straightener. Remington S9100 ProLuxe Hair Straighteners - Rose Gold. Using the unique PRO setting, found only in the PROluxe Straighteners, you can finally take the guilt out of styling. Babyliss 2069U Professional Salon Ceramic 230 Hair Straightener. 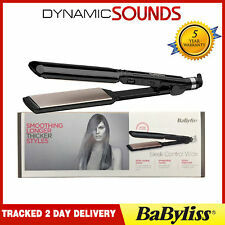 Babyliss 2069U Straightener. The new Pro Ceramic 230 has all the features you would expect from a professional straightener, giving you gorgeous hair at an attractive price. FLAT IRON BY KIPOZI. 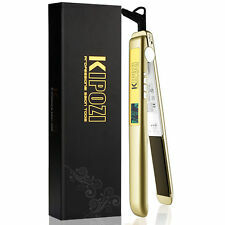 KIPOZI Professional Titanium Hair Straightener flat iron is made with the user's comfort in mind. 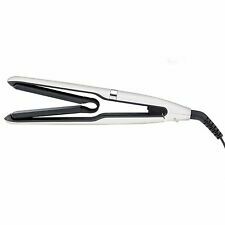 -Titanium made hair straightener iron provide even distribution of heat.Leaves your hair shiny and silk smooth. Featuring a digital variable heat setting range of 110 C to 230 C, you can style safely on all hair types and textures, including extensions. Further features include an integrated stand and a heat mat/bag. Get ready for super straight styling without compromising your colour with the Remington Colour Protect Straightener S6300. The ultimate tool to achieve smooth, glossy and radiant styles, this smart straightener features an Advanced Ceramic Colour Protect Coating, giving you the freedom to style whilst protecting your colour. H2D VI Rose Gold Hair straighteners. H2D’s special edition VI Rose Gold hair straighteners with ionic and infrared technology are hair-styling must-haves. The perfect temperature all depends on the existing condition of the hair. 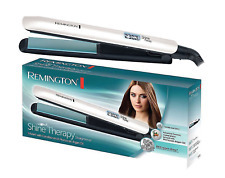 Remington S5525 Pro Ceramic Extra Hair Straightener. It glides through the hair smoothly and effortlessly with every stroke for beautifully sleek and shiny, ultra chic locks. It has an advanced ceramic coating ensuring even heat distribution and preventing snagging and hair breakage. And it's fast-working, reaching a top heat of 230C in a super quick 15 seconds, helping you to achieve silky, shiny hair in an instant. Auto shut off. Ceramic plates. Hinge lock. 230ºC high heat up. Heat proof pouch. 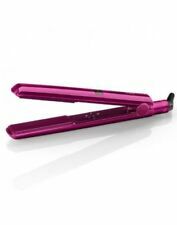 Create a sleek, lasting look with this BaByliss Velvet Orchid 235 Hair Straightener. Equipped withtourmaline-ceramic plates, this BaByliss straightener will glide effortlessly through your hair to create a sleek, straight look that lasts from morning until night. The plates are make with 100% tourmaline ceramic plate, which is used in salon quality hair curer and straightener. 4 in 1 interchangeable plates hair straightener, flat plate, Large, Middle, Small wave plate. Makes Hair Healthy, Young, Beautiful. The ceramic heats up hotter giving infrared energy waves that bring hair lots of benefits you don't get with a traditional blow dryer. Your hair is lovely and healthy. GHd Hair Straighteners model 4.2b (current model). Refurbished by ourselves to a very high standard (we have been repairing Ghd hair straighteners since 2010 and have extensive knowledge). The original multi-award-winning ghd IV styler is the perfect tool for quick, effortless straightening and easy curls and waves. 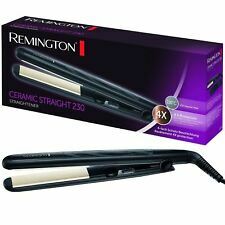 1 x Remington S8598 Keratin Protect Straightener. MPN : S8598. Guilt-free styling has arrived. Advanced ceramic coated plates are infused with Keratin and Almond oil, giving hair a smooth, healthy looking finish. Feature： **2 in 1 hair styling tool that can straight hair, curly hair. **Ceramic coated plate, protecting the hair from damaging. **Advanced PTC heater delivers consistent heat distribution with ultra fast heat-up time, just long enough **360 degree tangle free swivel, keep the cord from getting all tangled up when you are done with it. **You can choose different styles in different occasions like dating, party, club or meeting with your friends. **Now you can create a beautiful hair style in a matter of minutes! the hair should last 2-3 days (or more). Specification: Universal voltage: 110-240V, 50-60Hz Power: 45-65W Color:Golden Plug: UK Plug. Want a wonderful 2 in 1 hair straightener and curler to create your own hairstyle instead of having it done at the barber. ★ 【Unique Design】2 IN 1 Hair straighteners & curler with its own arc design, it is a perfect hair stylist for curling and straightening your hair.